Summary: ReStore Cashiers play a direct role in creating a positive shopping experience for the customers from the minute they walk into the door to the moment they leave. 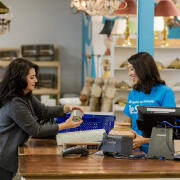 Cashiers greet new shoppers, answer phones and provide assistance to customers who are ready to purchase their items in an efficient and friendly manner. Time Commitment: Cashiers are expected to have consistent attendance. They work a four-hour shift from 9-1 or 1-5 Wednesday through Saturday, typically on a weekly basis. There are also flexible opportunities for cashier subs. All volunteers are required to sign a Release and Waiver of Liability annually. This should be done before any volunteer work begins. Copies of this form can be found in the office. Time Commitment: Cashiers are expected to have consistent attendance. They work a four-hour shift from 9-1 or 1-5 Wednesday through Saturday, typically on a weekly basis. There are many flexible opportunities for cashier subs.